Straight off to Sriwijaya University with Weka for Michael's talk and Pak Muin's. We spotted a sign for the event on the campus but were directed to a building wrapped in scaffolding (just as well Indonesians are for the most part slender; notice those equally slender struts) that didn't seem too likely a venue. Michael was pleased to see BMIC prominently listed amidst far larger companies. It turned out we were supposed to be at the graduate campus not the undergraduate, but we had left the hotel in plenty of time for mistakes to be corrected. Two dynamic and extraordinarily self-possessed young women made the opening remarks. Michael and I couldn't understand the Indonesian, but it was clear both these girls could have a future in broadcast journalism. Pak Muin speaks first on oil price trends. Pak Michael holds forth on "Sand, Sumatra, and the Search for Oil." I had heard the talk and seen the slides the night before, so I knew he wouldn't be booed off the stage for being menbosankan (boring). Here he's reading the opening remarks in Bahasa Indonesia that Chandra helped him with. Wellandic pacing: it works. I'm reduced to stammering brain death if I have to speak to an audience, but Michael is unfazed as long as he doesn't have to stand still. I thought I'd sneak a couple of shots looking back from my official front row position so that I could check how the audience was responding. Glad to see they're not all looking at the clocks. After coffee and cakes, question time — and those addressed to Michael were in very good English. How we anglophones are put to shame, at least the ones like me who are monolingual with mere smatterings of a couple of other languages. Dignitaries and student representatives assemble. When we got back to the hotel, Pak Herfendy was waiting to whisk us off on the afternoon's adventures. This busy contractor couldn't have been more accommodating, despite having to fly off to Jakarta later in the day. First he took us to his favorite restaurant for lunch. We had enjoyed the food at the Aryaduta: this was on a whole other level. Rumah makan = restaurant; pindang Meranjat is a fish soup that is the speciality of the south Sumatran village of Meranjat. A close-up of our genial host. Ikan seluang goreng, addictively crunchy small fish, like whitebait in the UK; sambal on the side. Giant prawns and small shrimp in red sauce from sungai (river) Musi, which runs through Palembang. Nasi, part of every meal in Indonesia. Uncooked it's beras; if boiled to porridge stage, it becomes bubur. The Indonesian proverb for "you can't turn the clock back" is nasi sudah menjadi bubur (the rice has already become porridge). Ikan mujair bakar. Mujair is another freshwater fish, which doesn't seem to have a western equivalent. If you had told me I would find a sauce made from fermented durian absolutely delectable, I would have said, "No way." But it was. This dish, cooked in a banana leaf, is pepes tempoyak. Pak Herfendy said that the bumbu (cooking spices or sauce), in addition to durian, probably contained red pepper, garlic, celery, and kunyit, which is a bright orange turmeric root. The outside fountain where we washed our hands. A lovely white bougainvillea with speckled leaves, next to the more familiar magenta version. Stomachs full (not as many leftovers as you might think from looking at how much food was spread before us), we opted for a bit of brain nourishment next. Pak Herfendy arranged for a guide to take us around Museum Negeri Sumatera Selatan while I paid for the tickets: Rp1500 each, less than a quarter. Astonishing value. Dragon boat in museum garden. I had thought these were Chinese, but the tradition is strong in Palembang — as is Chinese culture in general, throughout Sumatra. I can find online that annual races are a feature in several cities, but I can't find anything on the history. A replica of the inscription found at Talang Tuwo village in Palembang, dating from 684 CE. The beautiful script is Pallava and the language Old Malay. We have yet to see the original in the National Museum here in Jakarta — classic case of not taking advantage of what's right under your nose. The famous Batu Gajah (elephant stone) from Lahat, the territory where BMIC/APEC will be drilling. Several of the megalithic arca (statue) came from this area. This one is Bronze Age, circa 2000 BCE. Shades of Moore and Epstein. What was most memorable for us, though, was the extraordinary rumah limas (pyramid house, from shape of roof). This features on the reverse of the Rp.10,000 note. These traditional houses are raised on stilts since Palembang sits astride the river Musi. Our guide said that timber like this is no longer available. Two photos of vast main living area. Bedrooms off the main room. Pak Herfendy with a stuffed Sumatran tiger. Tigers are rare now, but these crocodiles still infest the waters. 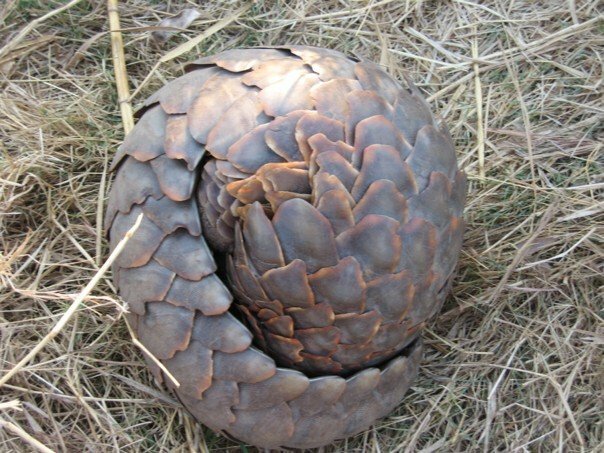 Michael wouldn't let me take a photo of the endangered pangolin post visit to a taxidermist, since it may have been caught in dubious circumstances. 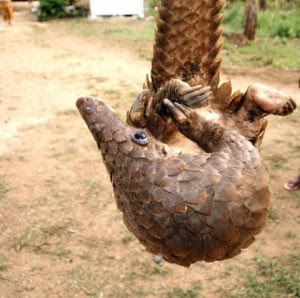 He knew the name of this hard-scaled, anteater-like creature, so I was able to steal three photos off the internet, from here and here. Pangolin comes from the Malay word pengguling, "one who rolls up." 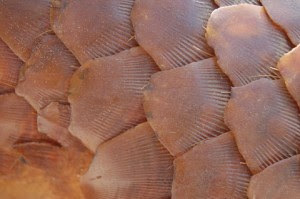 The scales are tough, but so delicately etched and shell-like in this image from the savepangolins.org site. Tree near house. I assume it's a type of banyan. Next on the itinerary was the Museum Sultan Mahmud Badaruddin II (of Rp.10,000 note fame), right near the Musi. From there you can see the Ampera Bridge, built by the Japanese at Soekarno's request as part of war reparations. Pak Herfendy said we should try to get back there at night to see the bridge at its most scenic, but in the end we didn't make it. Hence no photo. There was once a keraton (palace) on the site, but the Dutch razed it when they took over and built this official residence, of brick rather than the usual wood. During World War II, it was a Japanese military base. The floors are made of a distinctive local timber, unglen, or ironwood. This was also the preferred building material for the stilts that raised houses above river tide level; these trees were recognized as endangered by the Dutch back in 1845, but their protection decree was not enforced. Another throne room for weddings. Expats are evidently quite rare in Palembang; even 60+ tourists were quite the center of attraction. These girl scouts asked their leader to take our picture with them and then obliged me in return. We gathered from an article in the Jakarta Globe when we returned home that a national jamboree was being held in South Sumatra. Titled "SBY's New Army Against Radicalism: The Scouts," this piece also disclosed that the scouting movement here, founded in 1961, is known as Pramuka, an acronym for Sanskrit words meaning "young people who are willing to work" — "22 million members throughout Indonesia, in 317,091 local groups." A group of young nurses also requested photographs. All visitors left shoes on the front steps. Michael was particularly enamoured of this sousaphone. And I, of course, was riveted by the textiles. Herfendy needed to leave for the airport, but a driver from his Lahat team had arrived to take us back to the hotel. He was more than willing to continue the tour, but the next morning's crack-of-dawn departure for a ferry to Bangka Island — and the traffic we encountered on the drive to the hotel (a first: Jakarta's macet is not yet a problem in Palembang) — meant we decided on a quiet evening.